Experience the 2017 Ford Focus at Glenwood Springs Ford! 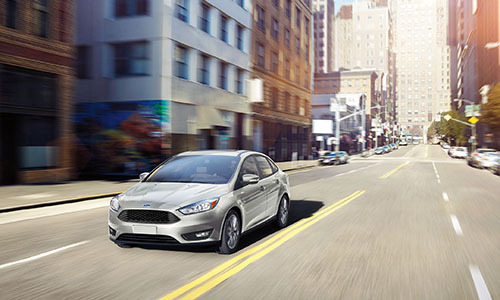 Explore the 2017 Ford Focus at Glenwood Springs Ford Today! 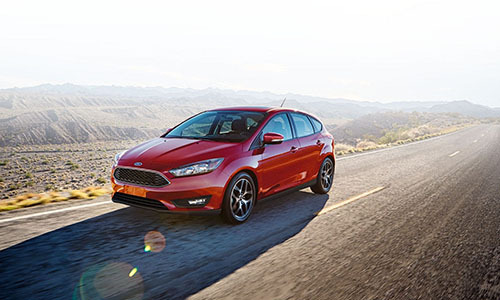 Performance, technological sophistication, and reliable safety merge in the all-new 2017 Ford Focus, which provides drivers with unheard of engine power, a range of driver assist features, and impressive performance specs, while also coming outfitted with some of the market’s most cutting-edge technologies to keep you entertained, informed, and connected. Meanwhile, the Focus is also designed to ensure your own and your passengers’ safety, with a slew of newly designed safety features. Read on for some of the exciting details, and then pay us a visit at Glenwood Springs Ford! 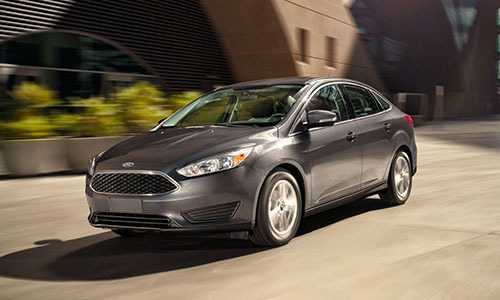 First and foremost, the Ford Focus offers drivers a slew of powerful driver assist features, as well as engine strength that ensures high rates of horsepower and torque, too. We’ll focus on just a few of these: (1) its engine power, (2) its electric power options, (3) its efficiency, (4) its Standard Torque Vectoring Control, (5) its Active Grille Shutters, and (6) its Electronic Power-Assisted Steering. Engine Power – The Focus gives you a choice between three traditional gas engines: a 1.0L EcoBoost, a 2.0L Ti-VCT, and a 2.3L engine. The first gives you solid horsepower rates as well as decent efficiency levels, justifying the awards it has received for being one of the best small engines of its class. On the other hand, the 2.0L engine promises 252 hp and 270 lb-ft of torque, while also ensuring strong levels of fuel economy, too. At the upper end, the 2.3L engine boasts awesome horsepower rates: 350 hp and 350 lb-ft of torque. Not only that, but the 2.3L will give epic top speeds and acceleration rates: you’ll be able to look forward to a top speed of 165 mph, for example, while also being able to accelerate from 0 to 62 mph in just 4.7 seconds. 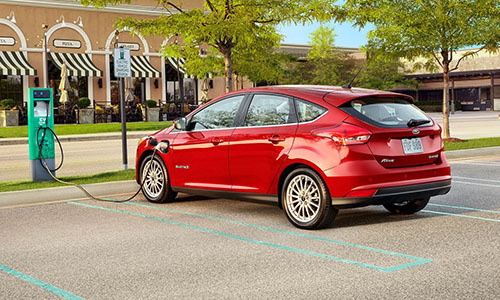 Electric Power – Yet the Focus also provides an electric option in the Focus Electric, which gives you a top speed of 84 mph while also needing no gas whatsoever and no oil changes. The upshot is that you’re going to release zero C02 emissions while driving it. The Focus comes with a standard DC fast-charge device, which can give the car a quick, 30-minute charge that results in a projected range of over 75 miles, at least based on EPA test protocols. And with its 240-volt/30-amp charging station—not standard but easily purchasable—you’ll be able to recharge your car completely in less than 5.5 hours! 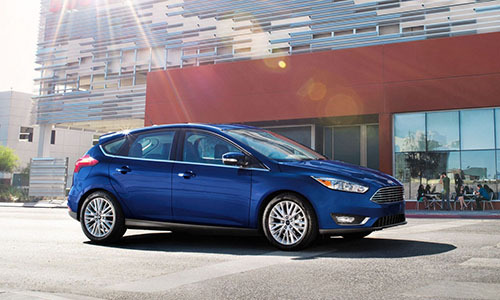 Efficiency – Yet even in the traditional Focus vehicles, you’re going to get decent efficiency levels. When equipped wth six-speed transmission, for example, the 1.0L engine provides 30 mpg in the city and 40 mpg on the highway, for a combined rate of 34 mpg. 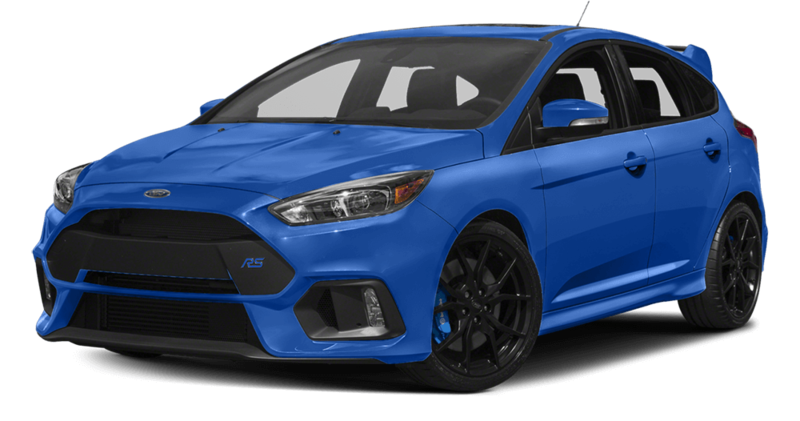 Likewise, the Focus’s other two engines keep efficiency levels as strong as possible without sacrificing anything to engine power and speed. 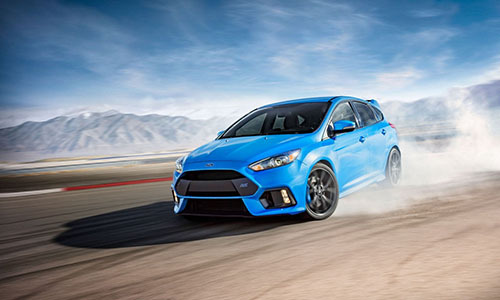 Standard Torque Vectoring Control – With its Standard Torque Vectoring Control device, the Focus relies on its braking system to create the effect of a limited-slip differential. By balancing the distribution of engine power between all the wheels on the car, the Focus can ensure that the drive remains as smooth and safe as possible, no matter the conditions and no matter the road surface. Active Grille Shutters – In any vehicle, the grille allows air to flow through the car’s system, cooling down the engine and the radiator. Yet the Ford’s Active Grille Shutters make this possible while also ensuring top-notch mpgs. Designed to improve levels of fuel economy, the Ford’s Active Grille Shutters are used to cover the car’s grille, making it possible for you to control the amount of airflow running through the car and thereby reducing the amount on aerodynamic drag it experiences and improving fuel efficiency. Electronic Power-Assisted Steering – Giving you a smooth drive and excellent responsiveness, the Focus’s EPAS system can automatically adjust to give you heightened sensitivity when you’re driving at high speeds as well as superb maneuverability when you’re driving at low speeds. Its pull-drift compensation is able to measure the inputs you as a driver give the car, and based on its findings it can adapt to changing road surfaces and better respond to differences in terrain and weather developments, too. 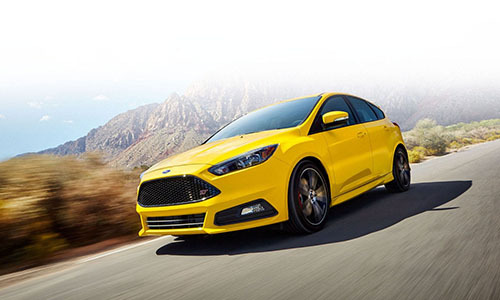 Likewise, the Focus is outfitted with some of the very latest in driving technologies, which promise to keep you entertained, connected informed throughout the drive. In particular, the Focus is embedded with (1) SYNC 3 Technology, (2) Intelligent Access with Push Button Start, (3) Smart Charging USB Ports, (4) MyFord Mobile App, (5) SiriusXM Traffic and Travel Link, and (6) 240-Volt/30-Amp Home Charging Station. 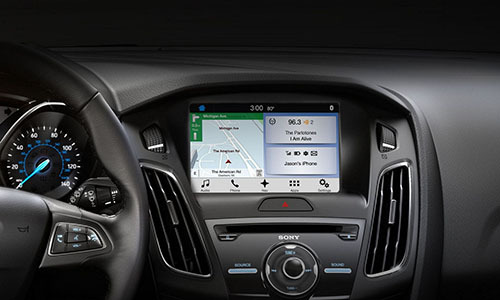 SYNC 3 Technology – SYNC 3 is Ford’s unique connectivity system, which offers up Apple CarPlay and Android Auto capabilities, meaning that you’re going to be able to stay in touch with all of your friends throughout your next journey. Yet at the same time, SYNC 3 makes it possible for you to get access to all of your own music, maps, apps, and much more from the comfort of the Focus’s cabin. 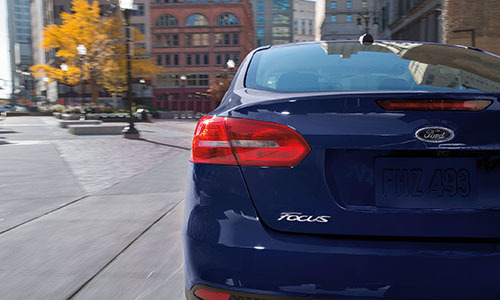 Intelligent Access with Push Button Start – In the new Focus, you don’t have to rely on a clumsy old key to turn the vehicle on and off. Keep a key fob in your pocket—or even in your purse or bag—and then simply touch the inside of the front exterior door handle and your Focus will automatically unlock. On the other hand, to start the car, just hold down the brake pedal while pressing the start button—that’s what we call Intelligent Access! Smart Charging USB Ports – Banish all worries that you or your passengers will lose the charge on smartphones or electronic devices. 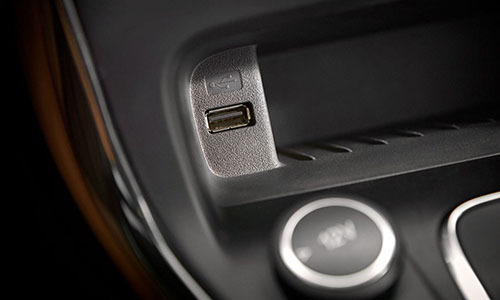 With the Focus’s Smart-Charging USB Ports, you’ll be able to connect your smartphone directly to the car’s ports, keeping them charged up throughout the drive and allowing you to stay connected with friends and family with no trouble whatsoever. 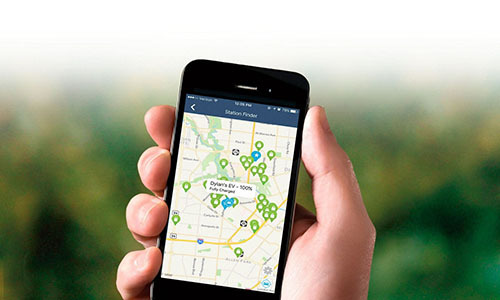 MyFord Mobile App – Perfect for drivers who need to monitor their Focus remotely, MyFord is an app that makes it possible for you to check up on how much charge your Focus has and can even help you find the next charging station with a few simple swipes. Meanwhile, the app’s mapping functions allows you to determine the location of your vehicle with a built-in GPS system, plus you can even set the interior temperature of the car before you arrive! 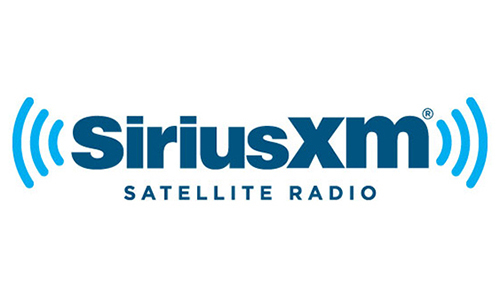 SiriusXM Traffic and Travel Link – With its five-year prepaid SiriusXM Traffic and Travel Link subscription, the Focus will give you access to one of the market’s best navigation tools, putting GPS technology and a 3-D mapping service at your finger tips. Get detailed traffic information, generate route maps, identify the locations of destinations, find gas stations and movies theaters, and much more simply using SiriusXM Traffic and Travel Link. 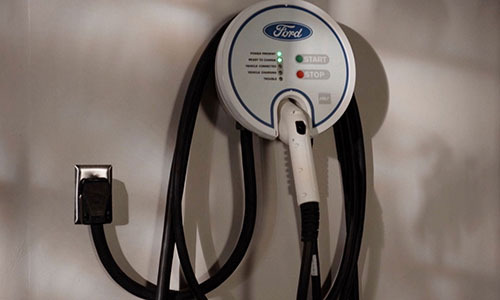 240-Volt/30-Amp Home Charging Station – Finally, with its 240-Volt/30-Amp Home Charging Station, the Ford Focus makes it possible for you to recharge your Focus in just 5.5 hours. Though this device is not standard—you can purchase it from AeroVironment—both portable and hardwired stations are available and will make it possible for you to ensure that your Focus remains constantly charged up and ready to go. Lastly, the Ford Focus comes embedded with a selection of safety devices that are designed with your own and your passengers’ safety in mind. Not only can you look forward to (1) reliable airbags, (2) a Rear View Camera, (3) Electronic Stability Control, (4) a Lane-Keeping System, (5) Blind Spot Information System, (6) and Cross-Traffic Alert. 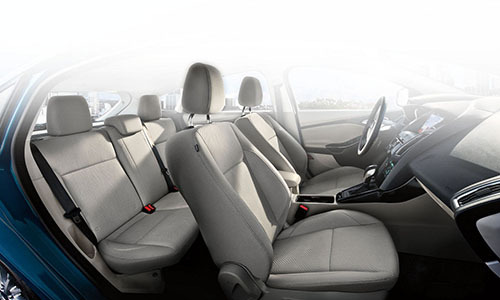 Airbags – The Focus comes with seven airbags—including dual stage front airbags, front-seat side airbags, side-curtain airbags, driver knee airbags, and more—meaning that you’ll be able to trust in the web of protection offered up by the Focus. Along with its door intrusion beams, which are made of boron steel, these airbags help prevent the possibility of serious injury in a collision. 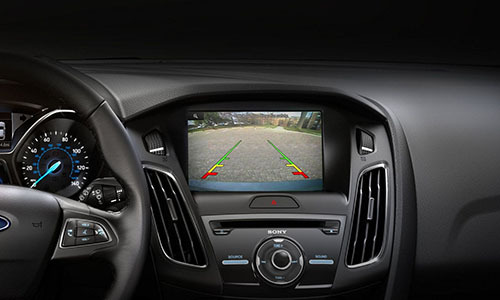 Rear View Camera – When you put the gear selector in reverse, the Focus’s Rear View Camera is automatically activated, providing you with a comprehensive image of the area behind your car and enabling you to back up without running the risk of colliding with unseen objects. Not only does the Rear View Camera strengthen your safety but it also gives you a great deal of peace of mind that you won’t damage your car, yourself, or anyone else. Electronic Stability Control – The Ford’s AdvanceTrac Electronic Stability Control system helps keep the Focus stable at high speeds and in most weather conditions and terrain types. By automatically detecting wheel slippage, Electronic Stability Control helps ensure that you remain safe and sound no matter whether you’re driving in snow, on ice, through gravel, or across rain-covered roads. Lane-Keeping System – Basically, the Focus’s Lane Keeping-System is able to help you remain in your lane when you’re barreling down the highway and thus help prevent you from straying form one lane to another, threatening your own safety and the safety of others. 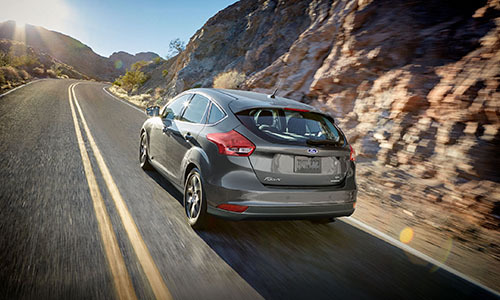 By giving you an alert when it senses you shifting from one lane to another, the Focus’s Lane-Keeping System is just one of the many devices designed to shore up your safety on the highway. 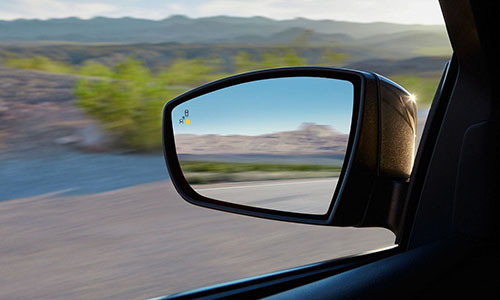 Blind Spot Information System – Blind Spot Information System—or BLIS, for short—is designed to keep you abreast of developments on the road around by scouting out for vehicles in your blind spot. Using a mirror attached to the mirror, the Focus can identify the presence of vehicles outside of your rage of vision and then alert you to their presence using a small light inside the car. By doing so, it makes it possible for you to remain as safe as possible whether you’re on the highway or just driving around town. Cross-Traffic Alert – Like its Blind Spot Information System, the Ford’s Cross-Traffic Alert devices is able to survey the area behind your car and identify the presence of oncoming vehicles, It can then alert you to their approach, allowing you to avert a collision much more easily then if you were simply relying on your vision and wits. Though it’s specially useful for drivers with driveways or garages, Cross-Traffic Alert is also going to helpful for anyone going about his or her business about town.